1. Super Coffee - I first found this coffee at Wegmans during a quick grocery run, and was intrigued to try because I heard great things about coffee with MCT oil. I was hooked after my first one and now buy it by the case for everyone in our house! Normally caffeine makes me very jittery but the MCT oil balances it and prevents jitters or a crash. It's dairy free and sugar free and has 10g of protein per bottle! 2. Spearmint Tea - I prefer mint tea over any other tea flavor, and spearmint is supposed to be best for helping cure hormonal breakouts. 3. Magnetic building blocks for Miles - I bought these because Miles is getting to that phase where he loves to stack things, but he is still a bit too young for them. However, I think he will love these in a few more months when he begins to understand how to put them together and build things. 4. Utensil set for Miles - We have been working with Miles for a few months now on using utensils and these were the perfect size for him to use at each meal. 5. Steamer - I don't iron my clothes (mainly because I hate it), but instead prefer to steam them! I bought a steamer years ago and it just recently died. So my friend recommended this one and I love it. 6. Wall decor - I initially fell in love with this set on Joss & Main but it was out of stock, so this one looked identical. I have them displayed in my bedroom right above my chaise lounge. 7. Toy workbench - Holy cow, this toy has been the biggest hit!! Miles loves this workbench and plays with it non-stop. 9. Face wipes for Miles - Best face wipes, hands down. I have tried tons of different ones and these work the best. They get him clean and smell fantastic. 10. Bath toys - I thought these foam toys would be fun for Miles to play with in the bath. When they get wet, they stick to the wall and come in animal shapes with cut out letters inside. He initially liked them, but has lost interest at the moment. However, I know they will be perfect as he gets older to help teach him his letters, colors and animals. 11. Ice roller - Best $12 I've ever spent! I love this ice roller and it feels amazing when my face is tired and puffy. I leave it in the freezer and then take it out 5 minutes before I plan to use it. 12. Coffee table books - Amazon is the best place to buy coffee table books because they are so much cheaper! I recently picked up this one and this one to add to my collection (see my entire collection in this post). 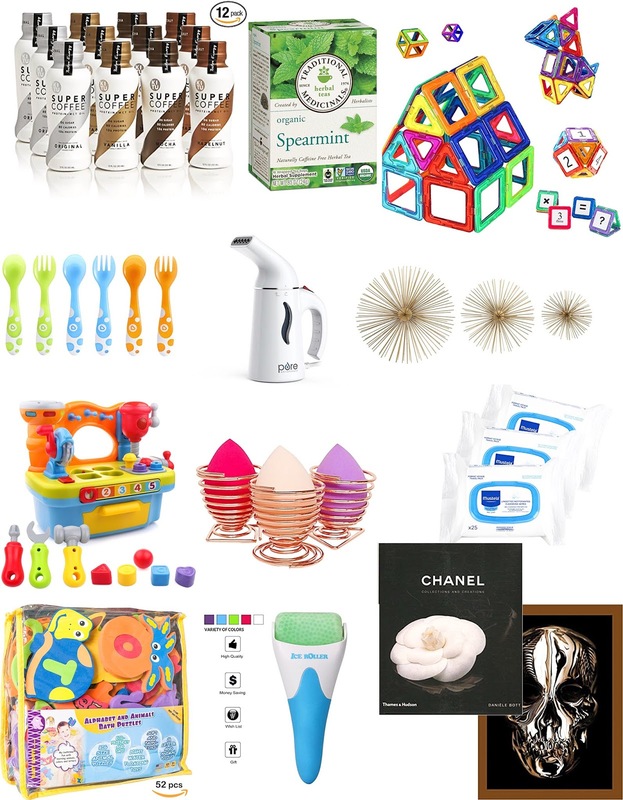 Visit my Amazon storefront here to see all my buys and favorites. I'm getting those magnetic blocks for my grandson.